Decorative concrete overlays give new life to structurally sound, worn existing concrete surfaces. 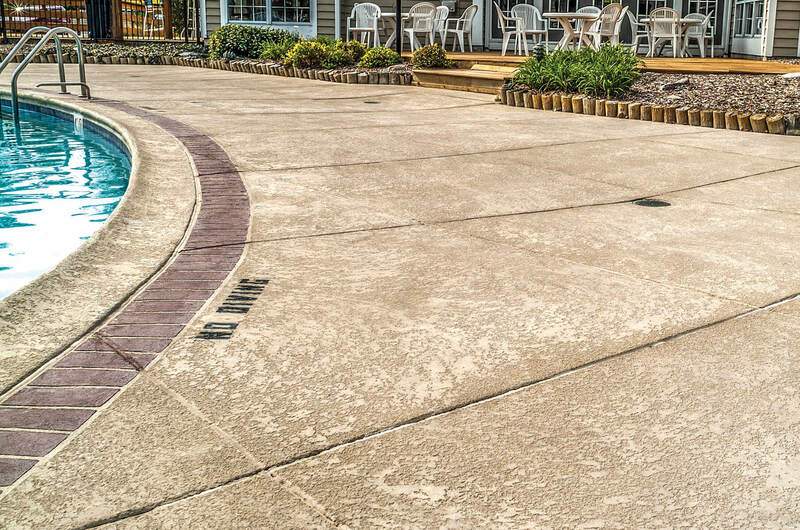 Butterfield Color® has engineered a number of concrete overlay systems to transform blemished concrete into a fresh canvas for achieving any imagined decorative concrete look. Whether you simply desire a consistent uniform color, a contemporary concrete stain appearance or are looking to obtain a natural stone texture or pattern, Butterfield Color® offers a complete system with fully compatible products and tools. A polymer modified micro-topping that mixes with water. 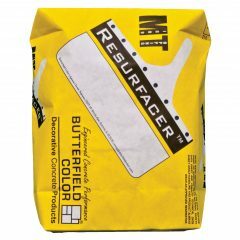 Create an abrasion resistant surface ideal for restoring worn or color blemished concrete. Available in two grades: Base Coat and Finish Coat, each grade available in cement gray. Approximate coverage: Base coat is 96 ft2 (8.9 m2) per 25 pound (11.3 kg) bag applied at 1/16″ (1.6 mm) thickness; Finish coat is 96 ft2 (8.9 m2) per 25 pound (11.3 kg) bag applied at 1/16″ (1.6 mm) thickness. Packaged in 55-pound (25 kg) bags. Each bag, when properly mixed with water, provides for approximately 24 SF at 1/4” thick (2.2m² at 6 mm thick). A polymer modified, cementitious material designed for resurfacing and texturing stable, non-moving concrete floors and hardscapes. Single application thickness can range from 1/8″ (3mm) to a maximum of 1/2″ (13mm), depending on thickness desired. 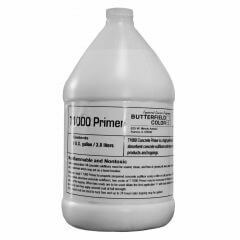 Use with T1000® Primer to provide enhanced adhesion and workability of the material. Compatible with Butterfield Color® Perma-Tique® Antiquing Agent, Perma-Cast® Stamping Tools, or stains. Packaged in 55-pound (25 kg) bags. Each bag, once properly mixed with water, provides a coverage rate of approximately 96 SF at 1/16″ thick (2.2m² at 1.5 mm thick). Single application thickness can range from 1/16″ (1.5mm) to a maximum of 3/16″ (4.5mm), depending on thickness desired. Wide range of Uni-Mix® Color Packs available. Multiple applications methods possible, smooth trowel, broom finish, splatter brush, or sprayed with a hopper gun. 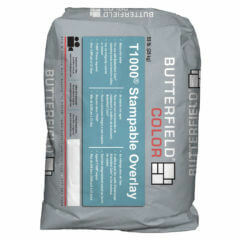 Compatible with Butterfield Color® stains or stencils. Available in both Cement Gray and Cement White. Premeasured doses of all Uni-Mix® Integral colors to be used with cementitious overlays (including vertical overlays and micro-toppings) and concrete countertop mixtures. Achieve colors similar to the Uni-Mix® color chart consistently with convenient packaging. 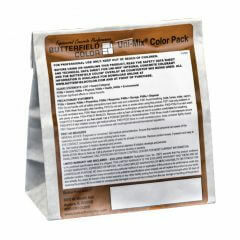 Pre-packaged in bags to work efficiently with one bag of overlay or countertop material. Compatible with Butterfield Color® T1000® Fine Overlay, T1000® Stampable Overlay, Cantera® Vertical Overlay, and Flat Out® Countertop Mix. A bonding agent which provides enhanced adhesion, workability and curing of cementitious overlays. Packaged in a 1 gallon (3.8 L) plastic bottles of concentrate, dilute 1 gallon of primer with 1 gallon of water. At diluted strength the coverage is approximately 400 square feet per gallon, but varies with surface conditions. A second application is recommended. Required bonding agent for use with T1000® Stampable Overlay, T1000® Fine Overlay, and Cantera® Vertical Overlay.